Disney Tips with Toddlers that will triple your vacation enjoyment! Walt Disney World in Orlando, Florida has always been on my America travel hit list and so, like it or not, I was taking the kids there on our round-the-world trip. Let’s be honest. I wasn’t going to Disney World for the kids AT ALL. I’m the one who has been dreaming of it, ever since I lived in Florida as a 19 year old backpacker for six months at Ft Lauderdale, and NEVER made it there, even though it was just hours away. 1 Is Visiting Disney with a Toddler even possible? 5 Tip 1: YOU don’t want to miss out! 8 Tip 4: It’s never too early to introduce your children to Mickey and Minnie. 11 Tip 5: FAST PASS. 12 Tip 6: Kids rides rock. 13 Tip 7: DO NOT MISS the following rides! 18 Tip 11: Ditch expectations. 20 Tip 12: See the big, wild, colourful shows. 23 Tip 15: Ditch the ‘”Lights, Motors, Action” Extreme Stunt Show. 26 Tip. 17: Lunch at the 50’s Prime Time Cafe. 29 Tip. 20: Akershus Castle with the Princesses. 31 Tip 22: Go on a search for Mickey-shaped food. 33 Tip. 23: Disney All Star Resort. 34 Tip. 24: Magic Bands. 35 Tip. 25: Catch the bus. 38 Tip. 27: Take your own stroller. 39 No. 28: Find your focus when it comes to buying Disney souvenirs. 40 Tip. 29: Join the Disney Pin Trading Tribe. 41 No. 30: Think once, then book your Disney vacation! 42 Roam the Gnome Toadstool Rating Guide – voted for by the kids! Is Visiting Disney with a Toddler even possible? With a six year old and almost-two year old in tow, I did wonder for a moment about how much we’d actually be able to do. Would we be able to ride the rides? Would we be able to take our stroller? Would the kids cope with long days and lots of people in one spot? Would the kids need a nap? Would the kids cope with queuing? I even asked myself if maybe I shouldn’t postpone it till …. later. You know, when the little one was maybe 10 or so. But I didn’t want to wait that long so I just went ahead and booked. Suffer the consequences and all that. I did more research to find out about taking your toddler to Disney World BUT I simply didn’t find the answers I was looking for in one easy spot. So, here are the answers to the questions I had. Perhaps you’ll find them useful too. I’m all for sharing info to make the magic of Disney (and it really IS magic!) a possibility for EVERYONE – toddlers or no toddlers! Add your own tips in the comments below. Tip 1: YOU don’t want to miss out! Never ever let the idea that because you have a toddler, or small children, stop you from travelling. I’m proof that you can do it. FIVE weeks on the road by myself with my two boys tells you that if I can, YOU CAN TOO. Disneyworld REMAINS HIGH on my list of places to go with children as the whole damn place is SUPER KID FRIENDLY. Staff are awesomely helpful, kind, and smiley- and I can tell you, after some of the glares and stares you get on airplanes, public transport and in restaurants, it is SO NICE to know everyone here has your back. GO! …as to how much you can do in a day, and be sure to factor in rest breaks with ice-cream, visit playgrounds or anywhere where they can jump, skip, hop for 30 minutes, AND be prepared with stroller/ergo/backpack. There are secret little spots you need to know about in each of the four Disney World parks- keep a list of these handy and be sure to grab your own ‘refreshment‘ on the way. Twenty minutes of ‘free play’ for the kids while you sit down and rest the balls of your feet, OUT OF THE WAY of determined ride-goers, is a win. Even more so if you can snack on a Disney treat. They are SO good. ….to let go of what you can’t do THIS TIME, and be at peace with what you CAN DO. We walked past or around EVERY one of the big famous ride at all four parks – the famous Space Mountain, Splash Mountain, and the Big Thunder Mountain Railroad at Magic Kingdom, The Twilight Zone Tower of Terror and Star Tours at Hollywood Studios, Expedition Everest and Kali River Rapids at Animal Kingdom, Soarin’, AND Test Track at Epcot – AND I COULDN’T HAVE CARED LESS. Despite the fact I DO LOVE big scary rides. Being with my little people and seeing the magic of Disney through their eyes was way more fun than any big ride. All the more reason for us to return again too! Tip 4: It’s never too early to introduce your children to Mickey and Minnie. Pay homage to the great fellow himself and while you are there, don the ears. It’s the done thing! …and you’ll hardly have to queue at all. We went from kid-friendly ride to kid-friendly ride to kid-friendly ride, and apart from Toy Story, the long wait was 15 minutes. AND it was Spring Break. Want to know how we did that? One of the benefits of staying at a Disney Hotel on a vacation package is that you can pre-book your Fast Passes UP TO 60 DAYS IN ADVANCE. That’s three quick ride entries guaranteed per day. Get online and do it. I repeat, get online and book those Fast Passes as early as your booking will let you. You need a bit of a plan so that you don’t waste time walking from one end of the park to the other to use your passes. The goal is to book your Fast Passes so that you enter the first ride about mid-way through your Fast Pass time slot (each Fast Pass gives you a window of one hour so if your time was 9.20am to 10.20am, you’d head there about 9.50am and try and squeeze another ride or attraction in before that too). By the time you’ve worked your way through the crowd and taken your ride, there will be just enough time to walk to the next ride and jump straight in the Fast Pass line. We’d grab a snack on the way to the third ride and arrive in the first part of the window for that one. THEN we’d quickly find a Fast Pass Booth and book another! In this way, we pretty much skipped all the lines. At Walt Disney World, we managed to grab SEVEN fast passes both days and rode all the kid’s rides AND returned a few times to our favourites at night too. Kids rides are no where near as popular as the big rides so we found it pretty easy to grab the next available timeslot- no waiting around at all. Tip 6: Kids rides rock. The unexpected thrill of most of the kids rides, along with the theatrics, beauty, familiar songs, AND interactiveness absolutely made my day. Jack, almost two, was equally thrilled AND could participate just as well as his big brother, with a little help from mama of course. In fact, it wasn’t uncommon for him to take a quick nap in the Ergo while we stood in the short queue but I knew better than to leave him asleep for the actual ride. A gentle nudge and he was awake and raring to go, desperate to be a big boy too. There was always room for the three of us in one capsule/cab/boat/car/people-mover so no-one ever had to miss out. And as long as I was prepared to hand over the joystick to the toddler, (biggest bummer of all actually!) all was well. Mostly, we shared the joystick and challenged Ned together, or I strategically gave Jack a button to press while I directed the blaster towards the target. My inner competitive streak was out in force and there was no way I was going to sit back and watch when it was so much fun! SO MUCH FUN. Tip 7: DO NOT MISS the following rides! Toddlers, bigger siblings, and YOU will get a kick out of them. Peter Pan’s Flight. Our favourite ride of all. VERY VERY POPULAR and there’s a reason for this. Grab an early in the day Fast Pass if you can. The Many Adventures of Winnie the Pooh. If by chance you happen to miss out on a Fast Pass, at least this queuing area has interactive games and things for the kids to do. Innovative and helpful idea for families with toddlers. 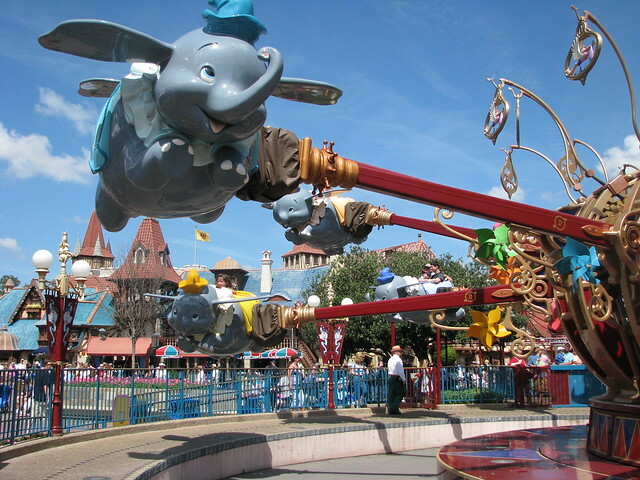 Dumbo the Flying Elephant. Another one that deserves a medal. When you enter the queue, you are given a beeper (like those in takeaway restaurants) and invited into the Big Top to wait. Children can run about (amok?) in the elevated tunnels, slide and carouse around instead of pouting and becoming a little grumpy bum in a long, long queue. A much-loved tradition. You can’t miss it. Living with the Land (a surprisingly interesting trip through the research stations and food production areas of Epcot- it’s really good!). It’s a waste of time as toddlers won’t have any reference to any of the films showcased. It’s in need of a serious update to get with the times. I love old school but this was boring. Boring. Capital B. …for different attractions WITHIN each park. I presumed (wrongly) that everything stays open until close. Cue tears when we ate an early dinner first before heading over to the “Honey I Shrunk the Kids Movie Set” adventure playground, only to find it had closed five minutes before we got there… at 7pm. We had planned a whole hour of fun before Frozen. I was SUPER SAD to miss this one out… maybe even more so than the kids as it was a top priority and I knew they’d love it. I’m even sadder now it’s gone. Boo hoo. Boo hoo hoo…. Swiss Family Robinson Treehouse was a bit of a letdown to me. I’ve been dreaming of climbing this gigantic treehouse for many a moon since childhood, and I imagined it to be something like the Magic Faraway Tree with nooks, and crannies, and secret hideaway spots, and ‘magic’. Instead it was a roped-off, one-way walk up a pathway that wound up, around and back down without any kind of adventure for me at all. Sterile. Disappointing as a reality check against MY dreams, BUT Ned and Jack both thought it was EPIC FUN. Given, it was night time, dark, and full of shadows, and the path was eerily lit by ‘candlelight’ beams, AND it WAS the first ‘ride’ we encountered on our first evening of Disney explorations, but perhaps if one can put aside romantic notions of yesteryear, it might be worth a meander for the littlies. Tired them out if nothing else! Tip 12: See the big, wild, colourful shows. …is, as you would expect, a hot ticket. It is, in my opinion, the best of the lot. We laughed, cried, got a little nostalgic, and sang our hearts out- along with the rest of the audience. It is a crack up… let me tell you. I won’t give it away, but put this on your MUST-DO list. Super dooper fun. Make Frozen Singalong your NUMBER ONE Fast Pass choice as far out as you can, (eg 60 days if you are staying in a Disney Hotel!) with Toy Story as a strong NUMBER TWO or THREE, depending on the windows of opportunity you are presented with. Ideally, you want both BEFORE lunchtime so you have time to snap up a few more Fast Passes at booths along the way. I pre-booked fast passes for Disney Hollywood just three days before our visit and ended up with an 8pm seating for the Frozen Singalong, which completely stuffed up our chances to use the Fast Pass system in the way above as we couldn’t risk letting it go. You can’t book a fourth Fast Pass until the first three have been used, which is why we ended up with an 80 minute Toy Story Midway Mania wait. Not only that, Hollywood Studios closed not long after the show finished, so we couldn’t even catch up a few extra rides when the majority of kids and families had left. We had to leave too. Poo bum. Evidently, ‘Finding Nemo’. It was raining and soggy, and I completely missed THIS memo but everyone we met that day kept asking us if we’d seen it, so it MUST be good. Go and come back and let us know what you thought! Walt Disney’s Carousel of Progress. Unexpected find of the night. Ned LOVED this. And you’ll come out singing… I guarantee it! The Seas with Nemo and Friends. Tip 15: Ditch the ‘”Lights, Motors, Action” Extreme Stunt Show. While it’s big on car chases, and explosions, this one is more suited to tweens and teens. It did… for all of two minutes. two Table-Service meals (includes the option to book a character meal! See no. 17 and no. 18 for more details). We did not pay for a single other bit of food during our six days and never went hungry, leaving our spending dollars for fun things like souvenirs and toys. I also LOVED the freedom of it, just swiping our band at the counter to ‘pay’ and the fact that the structure of the plan stopped squabbles. I wouldn’t go without it. Tip. 17: Lunch at the 50’s Prime Time Cafe. My favourite food experience at any of the parks, AND my favourite food too. Oh my… I had the the sampling of Mom’s favourite recipes. Golden-fried Chicken, Fork Tender Pot Roast, and Traditional Meatloaf with all the fixings WITH a real vanilla malt. The best thing I think I’ve EVER drunk in my whole life. My mouth is watering at the thought. I wasn’t shy about booking a character meal. (In the pic above, we are at Chef Mickey’s!) I booked one for four out of five meals on our dining plan. That took a bit of skilful planning- a 10pm hover around the computer on the 180th day BEFORE our due date of arrival. As soon as the time clicked over, I jumped on and booked the five restaurants including my chosen eating times in quick succession. I hovered around the 5.30pm or 6pm seating and this turned out to be just perfect- the right time for a rest and regroup, before gearing up for the nighttime plan. Plan to be at most character meals or experiences for about an hour. That’s about how long it takes to sit down, order your drinks, order your meal or choose it from the buffet, nibble a dessert, pay your tip, and gather your things. Be mindful of this when booking your later-in-the-day fast passes. Character meals are one of the BEST time-savers ever. You sit down, service staff take care of your menu choices or direct you to the buffet, and all the while, the characters on duty roam about the room, visiting table after table after table in an orderly fashion following a predetermined route. The characters continue to rotate throughout your meal… so for example, at the Crystal Palace Character Meal at the Magic Kingdom Park, you may see Pooh first, then Piglet, then Eeyore, then Tigger. Simply stay a few more minutes till the next one comes around. Eating lunch or dinner, AND being able to take photos with all your favourite characters WITHOUT having to stand and waste time in a queue… worth every cent. Book on the dining plan and it’s even more affordable and doesn’t everyone love a good buffet? Side note: the food at all our character meals was superb. Delicious, a huge variety of choice, fresh. The kids ‘buffet’ always included macaroni and cheese if you needed it, but in my opinion was a bit junk-foody and bland BUT the kids were allowed to eat from the normal buffet in any case. Ned ate fresh grilled salmon, I repeat, fresh grilled salmon… at every stop. Tip. 20: Akershus Castle with the Princesses. This is a once-in-a-lifetime event. We met Belle at the entrance for a photo opportunity, and Cinderella, Ariel from Little Mermaid, Snow White, and Aurora (Sleeping Beauty) walked around the castle, greeting each table one by one as we ate. Later in the proceedings, the princesses gathered for a special dance and all the children were invited to tag along behind their favourite princess for a little waltz. While Ned was too shy to get up and dance, and Jack was a bit overwhelmed by the whole experience (oh my… five pretty princesses in one place!) all the kids were beaming. I LOVED this character meal and the venue and the food, including a chance to pick from a Norwegian buffet for the entree and a tray of Norwegian sweets to try, was pleasant. A sweet ending to both days at Magic Kingdom. The bakery in Starbucks on Main Street had a pretty awesome selection of cakes – it was difficult to choose the perfect midnight feast. I stuck with an old favourite and was richly rewarded with a mouthful of thick gooey chocolate yumminess. Tip 22: Go on a search for Mickey-shaped food. We found five but there are plenty more! Can you beat that? Here’s a few you might want to look out for! Top 9 Mickey Shaped Foods. Tip. 23: Disney All Star Resort. Failing that, the closest hotel to the entrance of Magic Kingdom is the Contemporary Resort… It’s just a walk away. (Or catch the monorail… it stops inside the resort itself!) If you are planning naps, at least on your Magic Kingdom days, this is your spot. The only sucky thing about a Disney stay was that as ‘foreigners’, we couldn’t have our magic bands posted to our home. We had to pick up our magic bands at arrival when we checked in. So we got the grey ones. Plain, boring and ugly. Through “My Disney Experience” website, you are supposedly given an option to customise them with a colour. I didn’t see that before we arrived, nor do I know if it is even possible for non-US citizens. BUT a grey magic band is still a MAGIC BAND! It’s just a quick ‘snap’ at a checkpoint to gain entry to parks, use your fast passes, enter your hotel room, and buy goodies via your credit card without having to dig through your handbag. Tip. 25: Catch the bus. Not only that, you’ll feel your holiday start from the moment you get off the plane. Disney staff are SO helpful and keen to make your holiday a time to remember, they go out of their way to bring extra magic to the kids too- think stickers, badges, colouring-in books. Then there’s the buses from your Disney resort to your park of the day. Just pick the right line outside your hotel and wait for the bus to appear. We never waited more than 10 minutes EVER and every bus driver was jovial and friendly, and happy to give me a hand with the stroller if I needed it. The rides to the parks are short- 10 minutes or so and we loved chatting to our fellow bus travellers about their day- their plans or their top finds. Everyone is on holiday so there’s no better time to chat! … to soak up Disney magic at ‘home’. At Disney All Star Movies, there’s two pools, a food hall, a games room, a playground, a small movie-watching area, animators drawing caricatures, and a souvenir shop. You need a day just to let the kids explore all that! I didn’t plan a rest day at Disney, and it meant we only had limited time at the end of long days for Ned in particular to explore. We were all a bit bummed about that. Tip. 27: Take your own stroller. It’s no hassle at all. I seriously contemplated hiring a double one at the park (for about $200 for the week- oh heck!) but I decided to chance it and bring my own, hopeful it wouldn’t be too difficult or too bulky or too cumbersome to get on and off the express buses to the parks. I took my ergo carrier for Jack too, so Ned was able to sit in the stroller from time to time for a rest from walking, and a few times as the night grew long, both boys squeezed into the stroller together. Do not waste your money on stroller hire unless you absolutely have to. Save it for fun stuff. No. 28: Find your focus when it comes to buying Disney souvenirs. It’s SO much easier to dissuade or redirect children (and especially determined toddlers) away from a random purchase when you have a ‘theme’ to focus on and stick to. Don’t forget fun postcards to frame back home too. PS: The verdict’s out on the Disney Photo Pass. I loved our few pics but I think next time, we’ll put that $200 to good use elsewhere. Tip. 29: Join the Disney Pin Trading Tribe. We’ll talk in depth about pin trading soon but for now, all I’d say is jump in with both feet! There’s something a bit magical and kind of fun to join the ‘cool gang’ and whether or not you think pin trading counts in the hipster stakes, the kids do! Why not make THIS your souvenir focus? Collecting pins wherever you go… not just at Disney. Yes, I agree that $7 – $8 as a starting point seems a tad excessive for a badge but if you limit it to one pin per child per day, the kids will be so focused on finding the best one, there’ll be no time to dither and dally about with all the other (much more expensive) souvenirs on offer. No. 30: Think once, then book your Disney vacation! If there was one last thing I could say to you about taking your toddler to Disney World, it’s don’t even think twice. Think once and then book. This not-just-once-in-a-lifetime trip is worth every pretty penny, and a toddler’s enthusiasm and goodwill towards this fun adventure will create magic memories for the whole family. Roam the Gnome Toadstool Rating Guide – voted for by the kids! Disney Pixie Dust are random acts of kindness gifted by Disney Guest Relations staff and cast members. Take a look! Did you know you can join Chip and Dale at their campfire singalong to toast marshmallows for FREE? Thanks for all the great tips! We are about to take twin toddlers (almost 3-yrs-old), and am collecting all the helpful info I can!